It takes a monster, to stop a monster. And that's what Jessica has become as all-new episodes prepare for release this spring. Today, Netflix and Marvel have finally unleashed the deadly new Jessica Jones trailer, which pushes our favorite liquored up superhero to the very edge of madness. Will she be able to pull herself back down? Netflix not only released the second trailer for its highly anticipated original series Marvel's Jessica Jones, but they are giving us a cool new one-sheet as well. And it has been announced that Krysten Ritter's greatest character to date will be back in action for her second season on International Women's Day, March 8, 2018 on Netflix. 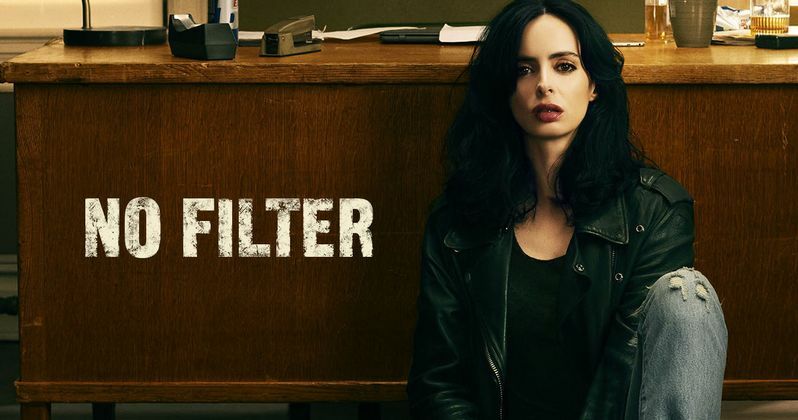 Marvel's Jessica Jones on Netflix is Executive Produced by series Showrunner Melissa Rosenberg (Twilight, Dexter), Raelle Tucker (True Blood), Jim Chory (Marvel's Daredevil, Marvel's Luke Cage, Marvel's Iron Fist) and Jeph Loeb (Marvel's Daredevil, Marvel's Luke Cage, Marvel's Iron Fist) who also serves as Marvel's Head of Television. As the tagline on the new poster boldly proclaims, 'No filter!' And that's what Jessica has become. One badass force of unstoppable power that can't quite quell the stinging quips that come flying out of her 'slightly' intoxicated mouth. She is the symbol of a generation, and nothing will stand in her way from preserving truth, justice, and an American whiskey shot from being poured, even when sitting in an Irish pub. Ritter had this to say about the return of her character. "Jessica is in a pretty dark headspace when we meet her at the top of season 2. What we've done again is kept the story very personal. If season 1 was in her head and in her mind, then this season will be more in her heart. It's still a psychological thriller, but it's more of an emotional thriller this time." When we last saw Jessica Jones, she was teamed up with the Hell's Kitchen Avengers. Otherwise known as The Defenders. Now she's back on her own, and making the streets safe again from bad guys, though she seems a little more concerned with her own personal vendettas. You can shed out the cool new one sheet, which gives us a great shot of Jones sitting on the floor, cause where else would she be. Thanks to Netflix for sending over the trailer.